To enforce civil rights laws and empower the citizens of Fort Wayne through education on diversity and discrimination issues. Metro seeks to partner with people and organizations who promote Metro’s vision. To make Fort Wayne a more diverse and inclusive City where every member of the community has equal opportunity to thrive and flourish and is empowered to assist in the eradication of discrimination. 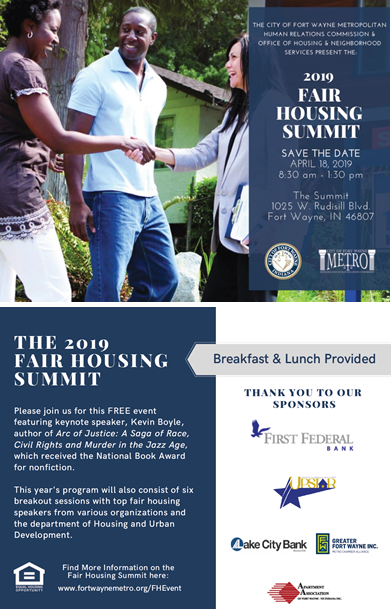 Metro's Annual Fair Housing Event will be on April 18, 2019. Monday-Tuesday 7:30 a.m. until 6:00 p.m.
Friday 8:00 a.m. until 12:00p.m. Special Holiday hours will be posted accordingly.